Our laundry room was lacking storage. We have a pretty big room designated just for laundry, but the only thing in there was a utility sink, an old fridge and the washer and dryer. So I decided I needed to build some shelves. I wanted to use the corner of the room when you first walk in the laundry room door. The big brown box (above) is our laundry shoot. The clothes fall into this wooden structure (that cannot be moved and is in the middle of the room). So we had this corner of the room that really couldn't be used because the laundry shoot was in the way. Now it is used all the time - mega storage! 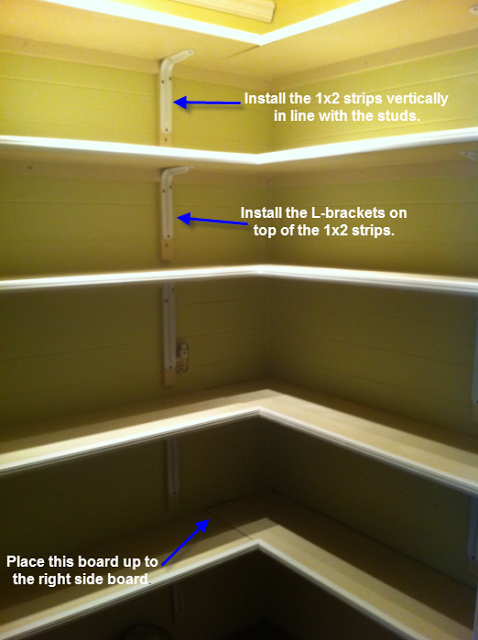 I built a box below the laundry shoot with shelves on the front (seen above) and shelves on the opposite side (facing the washer and dryer - seen below). 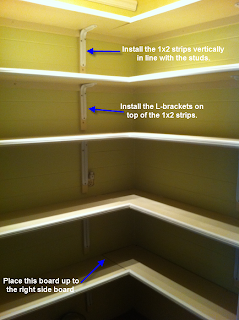 You can see the open shelves that are facing the washer and dryer in the picture above and below (not painted yet). I am so happy with my Laundry Room Pantry! Looks really nice! Don't you love the way you can see all the things on your shelf? Thanks for the link!